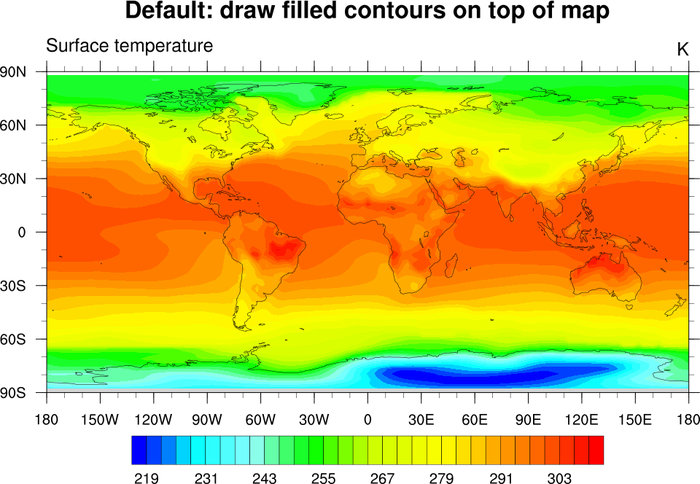 This page describes how to control the draw order of various plot elements, like contour lines, filled contours, XY curves, vectors, map outlines, polygons, markers, etc. Controlling the draw order involves the use of "DrawOrder" resources that indicate which of three phases a set of elements are drawn in: "PreDraw", "Draw", or "PostDraw". 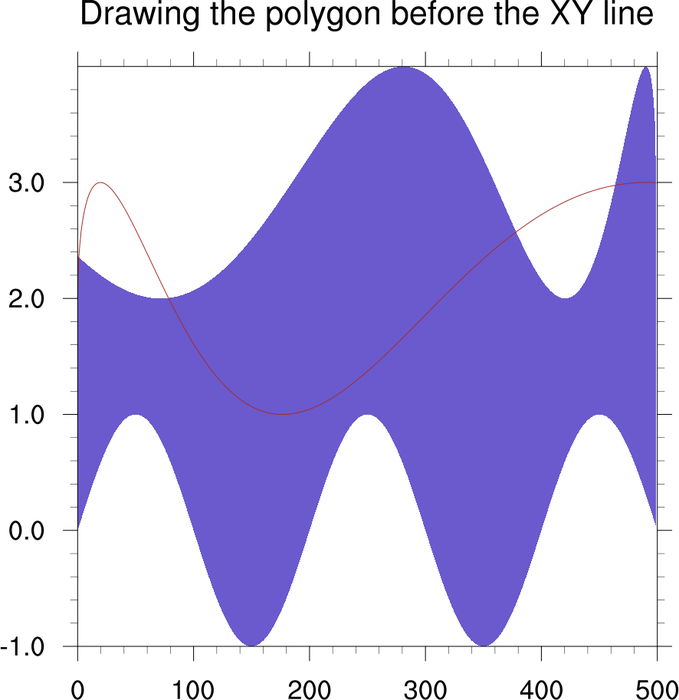 draworder_1.ncl: This example shows how to attach a polygon to an XY plot, setting tfPolyDrawOrder to "Draw" to force the polygon to be drawn first (the default is "PostDraw"). If you don't set this, the polygon will mask part of the line. Note: this script requires a bug fix that was added after V5.1.1 was released. To run this example with V5.1.1 and earlier, try draworder_1_fix.ncl for a work-around. As of V5.2.0, you can set tfPolyDrawOrder when calling gsn_add_polygon. Before V5.2.0, you had to set this resource when calling the plotting function (gsn_y). To run this example with V5.1.1 and earlier, try draworder_1_fix.ncl for a work-around. draworder_2.ncl: This example shows how to force the filled contours to be drawn before filled map areas by setting cnFillDrawOrder to "PreDraw". The mpFillDrawOrder resource defaults to "Draw", so these filled areas get drawn after elements in the "PreDraw" phase. The first frame shows the default draw order, the second frame draws the filled contours first. Note: The land is filled in gray by default in the latest version of NCL. draworder_3.ncl: This example shows how to force map grid lines and contour labels to be drawn before filled map areas by setting cnLabelDrawOrder and mpGridAndLimbDrawOrder to "PreDraw". draworder_4.ncl: This example shows how to attach polygons and polylines to a map plot, using different "draw order" phases. Whenever you attach primitives to a plot, you can only set tfPolyDrawOrder once for all those primitives. In order to have different draw orders for each primitive, then, you must create a dummy object (called a "LogLin plot"), overlay this on the map, and then use this new object to attach your primitives to. Note: this script requires a bug fix that was added after V5.1.1 was released. To run this example with V5.1.1 and earlier, try draworder_4_fix.ncl for a work-around. In this script, see how the three triangles are drawn during different phases. This is done by creating special objects for the blue and green triangles. 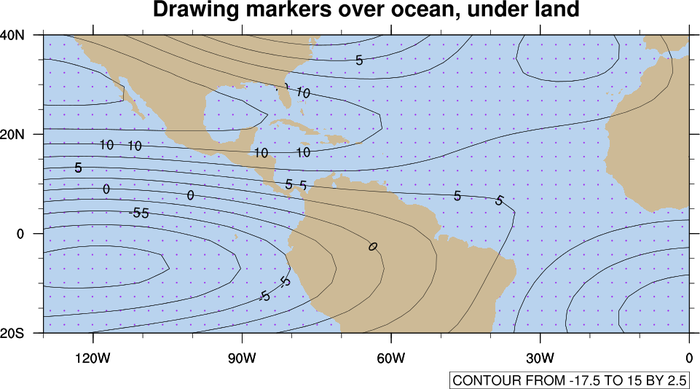 draworder_5.ncl: This example shows how to attach polymarkers to a map plot, such that the markers are drawn over filled ocean areas, but under filled land areas. 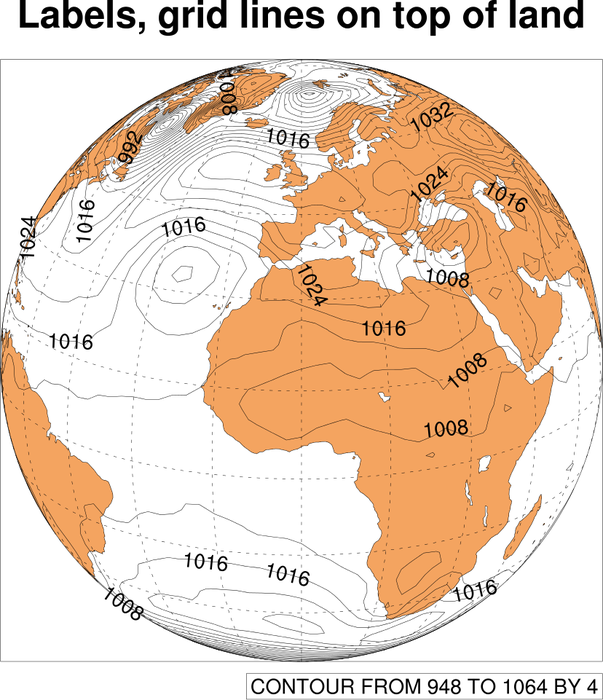 To do this, you must create two map plots: one with filled land and transparent ocean, and one with filled ocean and transparent land. This way you can attach the markers to the ocean-filled plot, and then overlay the land-filled plot which will mask the markers. To make sure the two maps stay together if you resize them, this script adds one as an annotation of the other using gsn_add_annotation. 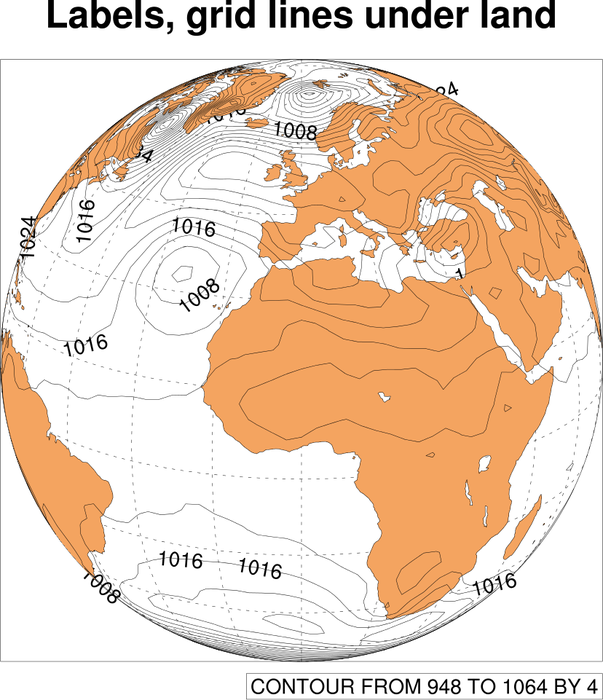 polyg_12.ncl: This example shows how to layer various polygons on a map to get a particular effect. 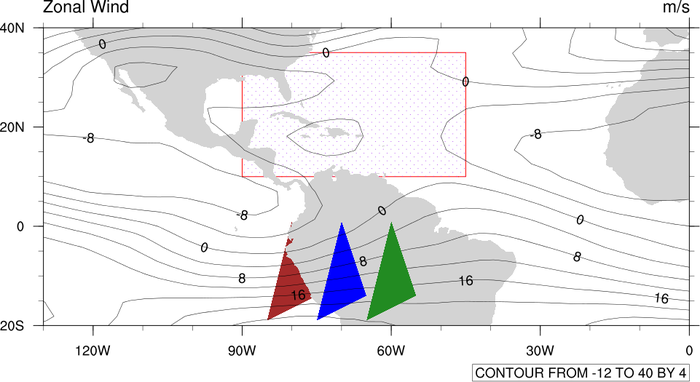 As the extratropical polygons (red/blue) require the ocean to overlay the polygons, and the tropical polygons (green/yellow) require the land to overlay the polygons, the only way to get the desired effect is to draw two plots, and to set tfPolyDrawOrder equal to Draw. A third blank plot is drawn over the previous two to draw the border correctly. This is a reproduction of figure 1b from Kutzbach et al. 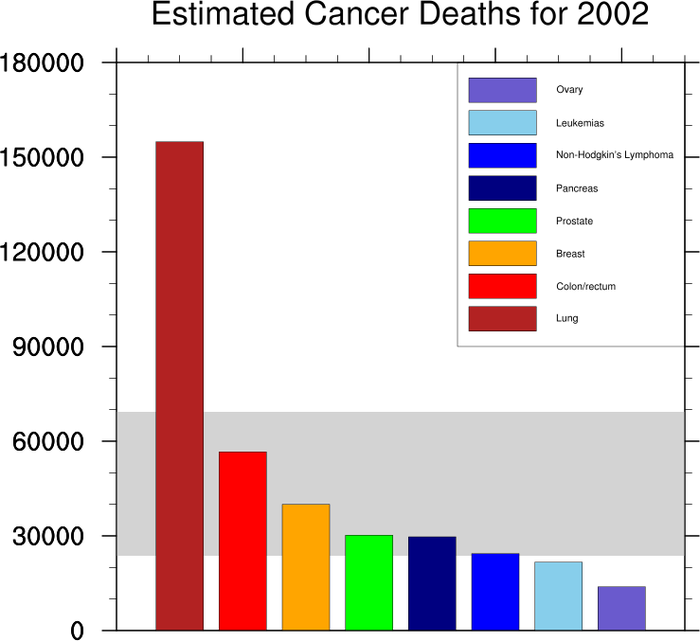 2008, Climate Dynamics, 30:567-579.
draworder_6.ncl: This example shows how to use a blank plot and overlay to force a gray polygon box to be drawn under other polygons that are part of a bar chart. This is necessary because the tfPolyDrawOrder resources applies to all elements attached to a single plot, and there's no way to control the draw order of individual elements. By using a blank plot, we can draw the gray box in the blank plot, and then overlay the bar chart on the blank plot, forcing the gray box to be underneath everything. 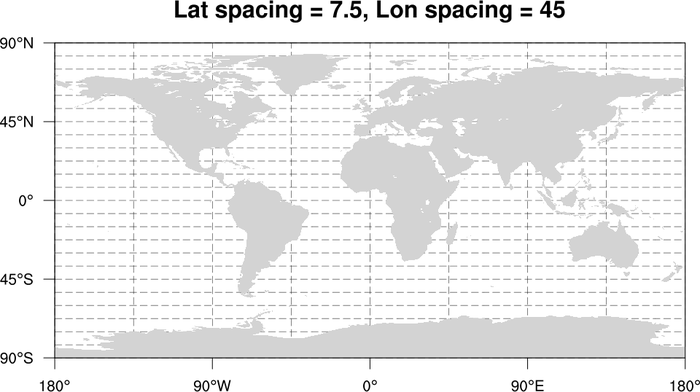 mapgrid_2.ncl: Shows how to draw map lat/lon grid lines underneath the map fill and outlines, by setting mpGridAndLimbDrawOrder to "PreDraw". draworder_7.ncl: This example shows how to add a filled polygon to an XY plot with grid lines turned on. 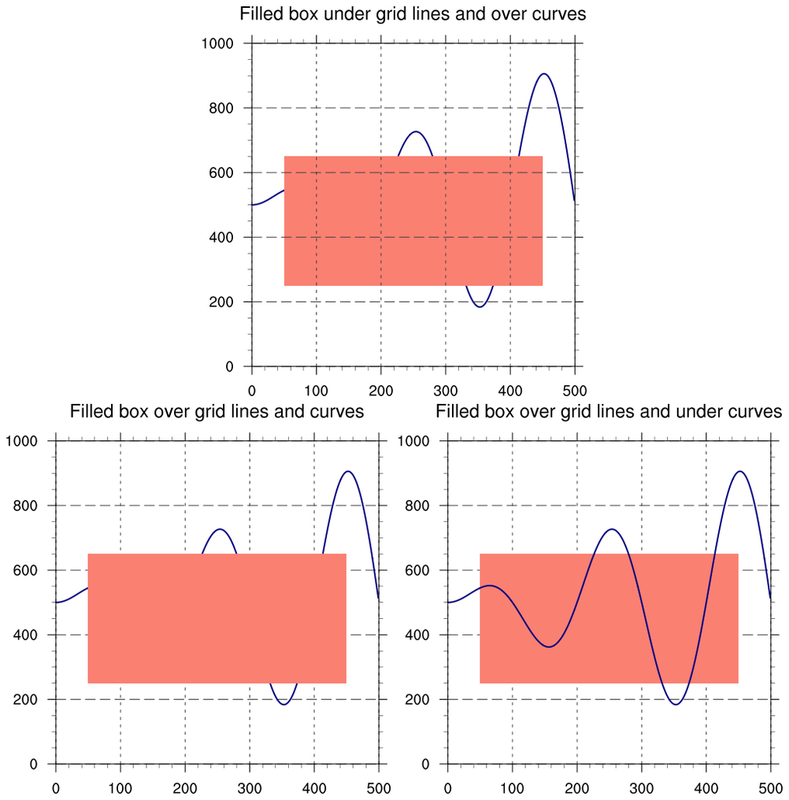 It uses xyCurveDrawOrder and tmGridDrawOrder to demonstrate various ways to control the ordering of various plot elements.